In many different ways our lives are full of sorrows such as sickness, poverty and bereavement as well, of course, as an awareness of our own failings and inadequacies. All the worldly things to which we turn for comfort can never fully take away all these sorrows, but the joy that God wishes to give us far outweighs them. Why do sorrowful souls find a special joy when they bring their sorrows to the Virgin Mary? In the Lity, in the Vigil Service for Christmas Day, we sing: “Today the Virgin gives birth to the Maker of all”. And in another hymn, in a reference to the evil one, “but now he sees a woman become Mother of the Creator”. As Mother of God, Who is Creator of heaven and earth, the Holy Virgin is indeed the mother of us all. Thus she has a place of special honour in our devotions and in our hearts. Hieromonk Seraphim (Rose) wrote, “This life has been given to us for trial, and in trial there is inevitably tribulation and sorrow; but the goal of human life is the joy that awaits those who pass the trial. This joy we know already even in the small tribulations of our life, if we face them with Christian faith and with the aid of the Divine grace bestowed in the sacraments and through the intercession of the Mother of God and the saints; and this is for us a foretaste of the never ending joy that awaits us in the next life. The very Lord of life was crucified and buried; but He rose from the dead and opened to all the door of eternal life. “In the world you shall have tribulation, but be of good cheer, I have overcome the world” (John 16:33). The origin of the ancient Joy of All Who Sorrow Ikon is unknown; at least it is undocumented. The first recorded miracle related to this ikon happened in 1688. At the time, the Russian Orthodox Church was ruled by Patriarch Joachim. His sister, the lady Euphemia, was sick and had suffered for a long time with an abdominal abscess, which was an open sore. It seems that it was so serious that Euphemia’s internal organs could be seen and there were very real fears for her life. Her ardent prayer to the Mother of God was answered in that she understood that she must have a moleben (service of intercession) sung before the Joy of All Who Sorrow Ikon that was kept in the Transfiguration Church in Ordynka. The priest was summoned. He brought the ikon, served the moleben, with the great blessing of water, and blessed the ailing woman with the holy water. Euphemia’s life was spared and she recovered from her malady. Giving thanks to the Mother of God, Euphemia made public the news of her miraculous healing and so this ikon came to prominence. The Church established a commemorative festival, on 24 October/6 November, in honour of the miracle. In the ikon the Mother of God is shown in glory in the centre surrounded by supplicants, the sick, the suffering, the poor, the bereaved and people who are in need or sorrow. On either side of the Mother of God are angels who are directing the petitions to her. The petitions are represented by small scrolls. 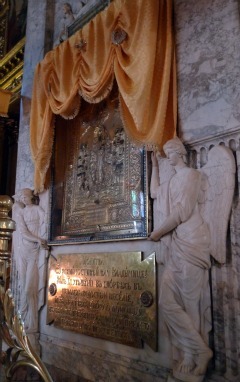 The original ikon (the Moscow one), shows the Holy Virgin holding the Christ Child but there is a second Joy of All Who Sorrow Ikon, in St Petersburg. This one is known as the ikon “with coins”. 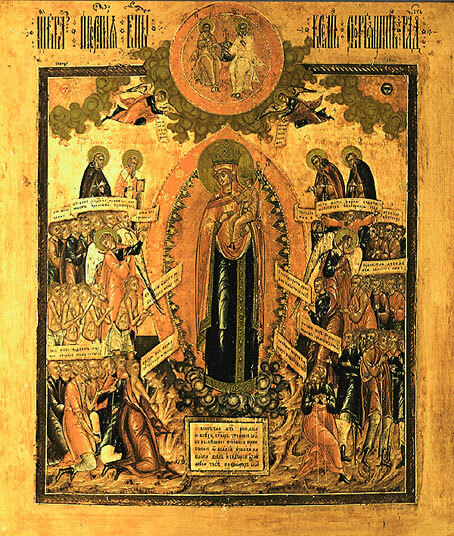 This copy of the Joy of All Who Sorrow Ikon, showing the Mother of God not holding the Christ Child, was found washed up on the bank of the Neva River and was kept in a chapel in the village of Klochka. It was dark and obscure. In 1888, in a violent thunderstorm, the building was struck by lightning causing considerable damage. The walls were charred and the alms box was broken scattering the contents on the floor. When the people inspected the damage, they found the ikon face down on the floor. When it was lifted, not only had it become bright and clear, but the coins were adhering to the surface. The renewal of this ikon was seen as a sign from heaven and it is commemorated annually on 23 July/5 August. 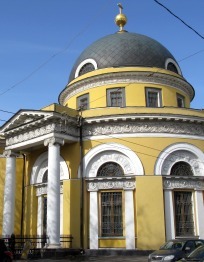 Exterior of the Cathedral of the Joy of All Who Sorrow, Ordynka, Moscow which still houses the original wonderworking Ikon. 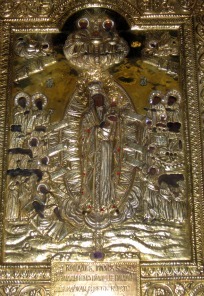 The Shrine of the Holy Wonderworking Ikon of the Mother of God, Joy of All Who Sorrow. A close up of the Ikon with metal rizza.